NORMALLY A MARINE SURVEY IS GREETED WITH DREAD, OR APPREHENSION AT THE LEAST. 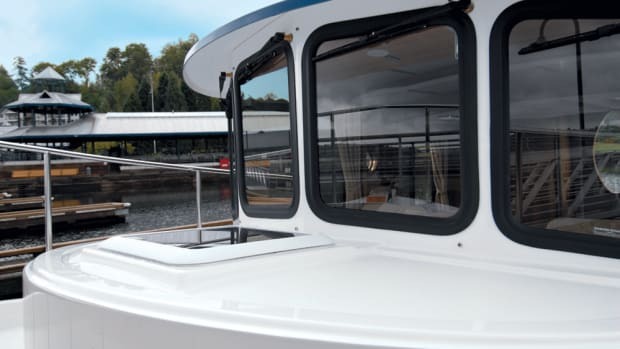 Something important--like a sale, a bank loan, or insurance coverage--always seems to depend on the outcome of a detailed examination of a boat and its systems. A bad survey may scuttle the desperately needed sale of a boat. As a buyer or owner, a survey highlighted with findings and recommendations may cost you bank loan or insurance coverage. As a seller, a survey may cost you a lot of money for unforeseen repairs. No wonder people get uptight about them. On the other hand, a survey can bring peace of mind, an assurance that all is right or identify the things a conscientious owner should do to keep his or her cruising yacht in top condition. I have just been through a peace-of-mind survey that was almost fun. It was done for me and no deal was at stake, insurance coverage was not an issue, nor was a banker demanding it. I did not have to share the information with anyone. Quadra was scheduled for a haulout for bottom paint and a general look at the underwater gear. I decided to hire a surveyor for a detailed, objective examination of the entire boat, a job best done on the hard. She had just turned 23 and had nearly 5,000 hours on the engines. She has had three owners (we&apos;ve owned the 42-foot Grand Banks for 12 years), all of whom seem to have done the right thing for her in terms of repairs and improvements. Because she is such an old friend, I thought that it was likely I had overlooked problems that might have developed slowly over time. Sure, I spend a lot of time in the engine room. And when we&apos;re under way I head below every couple of hours to look for obvious problems- squirting oil, engine coolant in the drip pan, frayed V-belts or smoking electrical wires. But just as one may not notice that the front porch lists slightly and its paint has faded and begun to peel, or that a friend seen often has developed wrinkles and a pot, I feared there just might be some troubles with my middle-aged yacht that my eyes could not or would not see. His fee for a 42-foot boat was $420. It was one of the best boating investments I have made. It could be for you, too, particularly if you have owned an older yacht for five or six years and have not had an independent expert check it out since the day it was purchased. I&apos;m not knocking shipyard employees. For the most part they are honest and do good work, but sometimes it&apos;s better to look for an objective surveyor who has nothing to gain from the work he or she may recommend. The most important thing came first: a slow walkaround found no blisters on the hull. There was nothing but the smooth, fair bottom to see. And that&apos;s good, since the hint of a blister sends boat owners into shock because of the enormous cost of repair. Quadra has a number of small bumps on her transom, just beneath the waterline. No surveyor has ever sounded an alarm, but fear has always lurked in the boating side of my brain. Harris unfolded a pocketknife with a blade about an inch long and asked if I really wanted to know. I nodded yes. He scraped one bump. The red bottom paint disappeared. He scraped some more and a little white bump came off, revealing only more shiny, white gelcoat. The verdict: Apparently someone on the Grand Banks production line in late 1978 had been a little sloppy and let a few drops of gel drip onto the mold before the full gelcoat was applied. There was nothing to worry about. The walkaround did find these problems: The propellers were out of alignment; one had some dinged edges. The inner cutless bearing on the starboard shaft had failed and was trying to spin out of its shell, but the shaft still turned nicely. Barnacles were thick inside the strainers covering through-hull valves. The sacrificial zincs on the shaft and transom had made their final sacrifice. None of those problems had affected performance-at least not noticeably. Surprisingly, the bottom paint still looked OK even though it had been applied five years before. Other than the usual skim of slime, which quickly washed away, there was no marine life attached to the bottom. Harris then did the hallmark job of all surveyors. With a ballpeen hammer he tapped along the hull, listening for the sounds that would indicate fiberglass delamination. On wood boats, the tapping quickly reveals soft spots. Tap, tap, tap. Everything sounded good. He swung full weight on the swim step, watching for but seeing no movement in the supporting struts. I pointed to cracks in two platform slats and confessed that epoxy repairs made about five years before had failed recently. He said that epoxy, unprotected by paint or varnish, ultimately turns to powder under exposure to ultraviolet light. One more lesson learned. It&apos;s only a cosmetic issue, but considering the size of the cracks, replacement of the slats goes on the to-do list. Harris recorded the hull number, which Grand Banks in that year hid beneath the swim platform. He examined the rudders for cracks that sometimes occur but found none. Looking up, he scanned the teak planking on the transom and noted black stains around a couple of plugs. That suggests, he explained, that water has gotten behind the plugs. We climbed a yard stepladder, crossed the swim platform and stepped up and over the transom into the cockpit. He was pleased not to find a transom door. Our doorless transom is safer, Harris said. Standing on the transom caprail, after asking my permission, he recorded the serial numbers of our inflatable dinghy (which is parked on the upper boat deck) and for the 8-horsepower outboard motor. We climbed the ladder to the upper deck and Harris crawled into the space ahead of the helm for an examination of the wiring and steering equipment. He reached out and turned the wheel with one hand while watching the gear perform inside. All was OK. He recorded the make and model designation of our radar, VHF radio and depth sounder. Next he opened lockers beneath the bridge seats, apparently looking for propane bottles that commonly are stored there. We have no propane appliances on board, so all he found was gear that we stow beneath the seats. The dinghy davit on the upper deck is rated for a load of 1,000 pounds. Harris swung his body weight onto it, looking for flexing and movement. Again, no problem. He stepped out onto the bridge wings that overhang the lower side decks and pulled out his hammer for another tap, tap, tap job. Good news. Nothing was coming apart out there. To this point the survey was something like the first five minutes of a physical examination. Your doctor shakes your hand, looks you over generally and then gets down to serious business. It was time for us to get serious. Inside the boat, Harris started in the forepeak. After clearing away V-berth cushions he opened the chain locker door. Quickly he found that the anchor windlass solenoid was not attached to a bulkhead but was suspended by wiring. Not bad, but not great. Worse, he found evidence that wiring connections for the deck switch had been twisted and taped. Twisted connections corrode and may fail. Without a proper fix I might not be able to pull the anchor in some remote cove along the Inside Passage. Also recommended: the installation of an inline 10-ampere fuse in the positive wire for the deck switch. Harris spent a lot of time with a flashlight and mirror beneath the berth. He explained that he was checking the points where bulkheads were fiberglassed to the hull. Occasionally, insufficient resin was used to stick bulkhead tabs to the hull, and after years of service they may fail and pull away. None had failed in that area, but he kept looking. He eventually found one that let go. It was in the lazarette and really out of sight. It did not threaten the structural integrity of the boat, and it was easy to fix. In the saloon, Harris itemized all electronic and galley gear. He probed deeply into the wiring beneath the helm searching (fruitlessly) for signs of overheating. Again, he checked the cable steering system. Although the handheld fire extinguishers in the saloon and stateroom had current tags, three of them showed low pressure on their gauges. Why? Find out, he said. Belowdecks, in the engine room, he found evidence of aging: A rubber fuel line linking the primary filter and the engine lift pump was soft at one end, a short length of seawater cooling hose needed replacing, the packing nut on the fuel manifold valve was loose and one small drop of diesel could be seen, a water heater connection showed signs of dripping. All small stuff, easily fixed. The big hit in the engine room was Harris&apos; discovery of small cracks and checks in exhaust hoses on both engines. Although his final report did not list replacement as "essential for continued safe operation" of the boat, he told a horror story about what happens when one fails and breaks and recommended replacement of the hoses while the boat was out of the water. While he was belowdecks, Harris checked the switches on the two bilge pumps, examined seawater strainers serving the engines and generator, pulled the caps on one battery (but not seven others), traced through the DC charging system, and used a flashlight and mirror for a close examination of both fuel tanks. He muttered about the difficulty of checking out a generator enclosed in a sound shield. There were some small hits elsewhere, too. The AC receptacle serving a TV showed reverse polarity. I noted that the TV didn&apos;t care, but he said fix it. (He was pleased to see ground-faultinterrupt receptacles in the head and galley.) The manual bilge pump did not work (no surprise in a boat of so many years). A seawater inlet, installed to supply the marine toilet but abandoned with arrival of VacuFlush, needed a permanent cap or plug. Volunteering for a survey is unusual. "No, it&apos;s pretty darned rare," Harris says. "Usually, it&apos;s because an insurance company asks for it." Had I been a prospective buyer, Harris would have done extensive testing of all systems- made sure the furnace worked, as well as the refrigerator, freezer and water pumps. He would have checked the electronics thoroughly and proven that the anchor windlass turned, among many other things. That wasn&apos;t necessary, because I know they work. I was more interested in the underlying health of the total boat (as in blisters) and the simple but vital things that can spoil a boating vacation if they fail (bad wiring, a split fuel line, a damaged exhaust hose, for example). We had to send to California for exhaust hose of the proper size and length; imagine doing that from a wilderness area 600 miles from home. 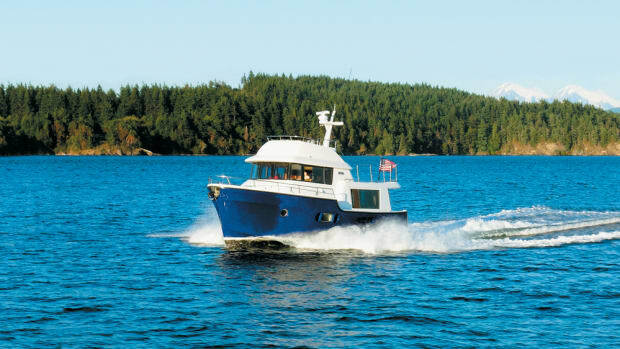 Before Quadra was dropped back into Fidalgo Bay, she had shiny, freshly tuned props; a new cutless bearing and exhaust lines; and the barnacles had been evicted. A few hours of my time polished off the other findings on Harris&apos; report. We cruise in remote waters, and my goal is to get there and back without problem. If an investment in a survey-and the corrections recommended by the surveyor-increase our odds of having a safe and successful round trip, then it&apos;s an investment well made. With a surveyor like Harris, a spring checkup also is a seminar in boat safety. He asked me questions, and answered mine fully. After 12 years of ownership, one might think that I know everything there is to know about this particular 1979 Grand Banks. I don&apos;t, but I moved a little closer to that moving goal after nearly five hours at his elbow. It&apos;s often some little thing that causes a breakdown while under way or leaves a boat stranded at a dock for days. Many of us do a capable job of keeping up with the little things. And sometimes a little help is welcome.